Computer Security / By kb3cpq / In this topic, you will find information about how to protect your computers and network from malware, details about emerging threats and reviews of leading anti-malware products. Webroot Antivirus with Spysweeper 2011 is one of the best available anti-spyware programs on the market today and the one I choose to use. I simply love it. This program offers the user seamless protection with minimal configuration effort. The settings are easily accessed and managed through menu options used to initially configure the program and make any necessary changes later. However, if done correctly, changes should be a rare occurrance, and interaction from the user will be kept to a minimum. An explanation of each available Webroot Spyware settings option, the preferred setting and additional resources available to become familiar with configuration issues will be discussed below. Upon clicking on the Webroot icon to open the program, the user is presented with a screen which gives an overall view of the current protection condition of the system. It is here, that the last scan date, how well your system is protected and the choice of performing a system scan manually or automatically is provided. This is also where the choice to configure Webroot Spysweeper settings is made. A full explanation of how the system is protected, meaning what shields are currently running, is also available. Contained within this screen is also the option to view tutorial videos for further explanation of configuration options. The My Account screen shows an overview of what product is installed, in this case, Webroot Antivirus with Spysweeper. However, if the system has additional Webroot software installed, it too will show up here. The name of the system the software is installed on and when the software is set to expire are also indicated here. Information regarding the specific key code, version of software and the amount of both virus and security definitions that are currently loaded is also provided. Managing specific account details such as software activation, email verification and general account settings are provided here as well. The first sub-menu located within the Settings drop down menu is Scheduling. From this window the user has the option of setting the system scanning schedule to Automated, which will allow a system scan to occur at a pre-determined date and time as long as the PC is on and the software is running. There is also an option to add specific events to occur at a date and time configured by the user. This allows flexibility to manage specific scan events simultaneously. 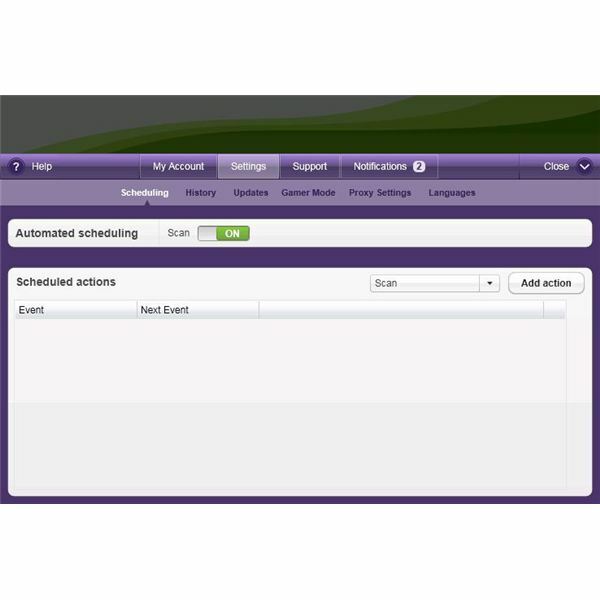 This is a particularly useful option if the user wants to customize the scheduling of scanning events. This Settings sub-menu option allows the user to view all historical scan data from one location. Users have the option to view the historical data encompassing the last 30 days or all data regardless of the date executed. An option to clear all historical data is also provided. A general summary is provided describing scan activity that was performed or any system security changes that were made, as well as all results from each activity. This allows for a consistent time record of all scan events. The Updates sub-menu of the drop down menu allows the user to manage how software updates are performed. Product Update allows a choice of either automatically downloading any product updates, which is recommended, or being notified before any updates are downloaded and installed. Product updates will include any software revision updates or changes. Protection Update allows a choice of either automatically downloading any security updates, which is recommended, or being notified before any updates are downloaded and installed. Security updates will include any protection updates or virus and spyware definition updates. 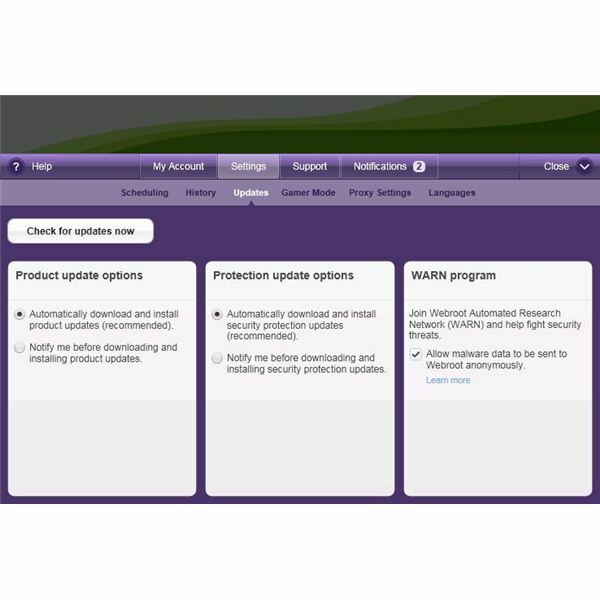 The WARN program option offers the user an opportunity to help in the fight against malware. WARN (Webroot Automated Research Network) is a program that allows Webroot to use any malware data found on your machine to update existing definitions of malware and develop future identification and extermination methods. 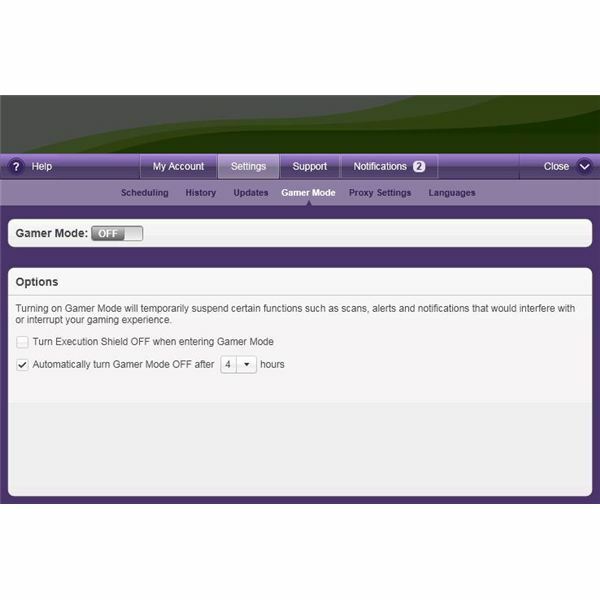 The Gamer Mode sub-menu of the Webroot Spysweeper Settings drop down menu allows the user the option to suspend scans, alerts and notifications that would otherwise interfere with the ability of the user to play onine games efficiently. There are two additional options for the user within the Gamer Mode menu. You can choose to turn off Execution Shield while in Gamer Mode, which will allow executions to run uninterrupted. You can also set a time for Gamer Mode. After this time limit is exceeded, the software re-enters normal protection mode and will no longer suspend scans, notifications and alerts. The Proxy Settings sub-menu of the drop down menu allows the user to manage proxy settings. If the user is connected to the Internet through a different computer than the one that Webroot is installed on, Proxy Settings will need to be configured. Credentials such as your username and password, along with the server and access port used for the proxy machine will need to be entered using this menu option. The Webroot Spysweeper Support drop down menu allows the user access to account information and user support options from Webroot. Get help from Webroot allows the user access to technical support and the ability to ask Webroot a question directly. Video Tutorials allows the user access to Webroot Spysweeper Settings videos for detailed information on configuration management options. The Webroot SpySweeper Notifications drop down menu allows the user to view all notifications sent by Webroot for informational purposes. The notification of a potentially harmful file or if an activity has been completed, will be listed with a date and time associated with the discovery or activity. Webroot Antivirus with Spysweeper 2011 in my opinion, is one of the best available security management software products on the market. I have been a loyal customer of Webroot products for a few years now, and I can honestly say, I have throughly enjoyed the experience thus far. The ease of configuring the Webroot Spysweeper Settings is unparalleled with any other anti-virus program I have used. Another aspect that I really like about the program is that it is completely intuitive, meaning that the options you think should be included are located in the places you think they should be. Everything is right there at the user's fingertips. I would recommend this program to anyone.